The Nostalgia series and one of our most popular finish finally comes together. We give you the Wood grain Stars...a state-of-the art creation comprised of 30 melodies. On the hour, the dial opens and splits into three sections revealing five golden bells. 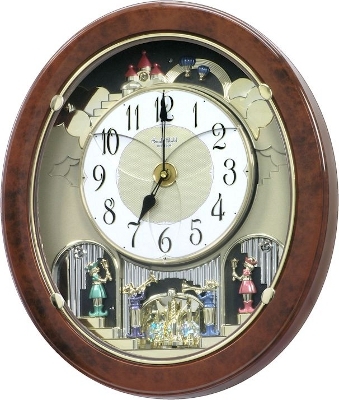 The beautiful burl wood colored frame along with the crystals and gold colored accents make this clock a truly elegant addition to any home. Clock is battery quartz operated.